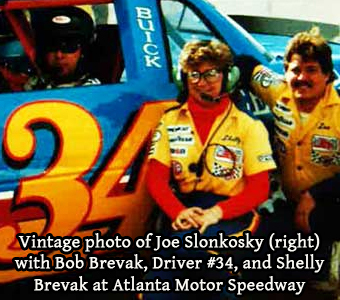 Joe Slonkosky, long-time Brevak Racing Crew Chief and the team’s 1990 ARCA Champion Crew Chief, hails from Versailles, Ohio. He has been a part of Brevak Racing for over 20 years…helping to continue the Brevak legend. Joe has also been second generation racer Brent Brevak’s crew chief in ASA and most recently in ARCA. In January, just days after the ARCA Daytona test, Joe suffered a stroke. He continues to rehabilitate at Versailles Health Care Center in Versailles, Ohio. Fans and Friends can send cards or well wishes to: Versailles Health Care Center – 200 Marker Road -Versailles, Ohio 45380 OR can log on to caringbridge.org to sign his message book at Joe Slonkosky. We pray for his speedy recovery and hope to see him back at the track real soon.